Pontoon's Dirty? - Slowing Your Boat Down?- Using More Costly Fuel? We Clean Your Pontoons To Look Like New! Boat Repair - Boat Tune-Ups - Oil Change - Boat Engine Repair - Boat Engine Exchange - Boat Lower Unit Repair - Inboard, Outboard And Pontoon Boat Repair For Most Makes And Models. Click Here For "Preventative Maintenance" Services Provided. Pontoon Boats are becoming a favorite for many boaters on Lake Conroe. Often these boats are left in the water or on a boat lift year around and preventative maintenance is often overlooked. Taking the best care of your Pontoon Boat is making sure you perform the recommended routine maintenance. 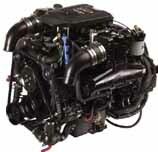 On this page is an outline of service that needs be done on a regular basis for an Outboard Engine. A more complete guide for taking care of your specific engine can be found in your engine operators manual. . At no time, should any of our recommendations take precedence over information found in your engine operator's manual. This is maintenance you many wish to perform yourself or you may have a service center near you perform the maintenance. The winter months are a good time for maintenance because you probably won't be using your boat as often and it will then be ready for use in the Spring. 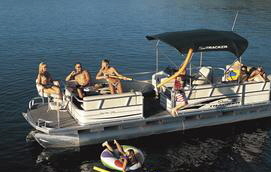 Pontoon Boats are powered by both Outboard Engines and Inboard/Stern Drive Engines. Click Here For Maintenance Schedule For Your Inboard /Stern Drive Engine. * Refer to engine operator'smanual for details ! In-The-Shop maintenance for all makes of Pontoon Boats. Engine Maintenance is very important; but, with a Pontoon Boat, there are many other issues to consider. One area that is often overlooked is small leaks in the pontoons. You don't necessarily have to hit a submerged stump, log or other object in the water to cause a leak in your pontoons. Just general use will often cause small leaks. Pontoons that have water in them will increase the weight of your boat and put an extra load on your engine causing reduced performance and increased fuel consumption. It is a good idea to have your pontoons check every couple of years. If you notice that one pontoon sits lower in the water than the other pontoon, you can be sure there is water in that pontoon that needs to be removed. Locating and fixing leaking pontoons takes specialized equipment and needs to be done by a service company. Specialized aluminum welding techniques will be required to weld the specific area/areas on the pontoon that are leaking. Lake Conroe Marine is equipped to remove the water and repair any damage to your pontoons with specialty welding equipment and experienced technicians. If you do not have a trailer for your boat, we provide a pick-up service at several of the local marinas. * Click Here For Tips On Winterizing Your Mercruiser Engine.